I first learned to dive with Torbay branch of BSAC back in 1987 when I was 13 years old and I have not looked back since. Some years were spent with Brixham SAA/BSAC as well as the branch at my university in Cheltenham. I am now a member of Totnes BSAC. I started taking an interest in underwater photography when the digital era made it relatively cheap for sport divers to take up the challenge. Since then I have used a stream of Canon, Olympus and Fuji cameras. I have recently updated my kit to an Olympus E-M1 in an Aquatica AE-M1 housing. I find that the micro four-thirds system suits my style of photography perfectly. Latter day influences stem from my both my love for the marine habitat and from the open and friendly family of underwater photographer in the UK. Paul Naylor’s books have been my bibles over many happy years of shooting identification photos, where as Alex Mustard and Peter Rowlands have provided me with technical, artistic, professional, and ethical inspiration and guidance. Over the past few years I have written a number of articles on diving, snorkelling and marine life in the UK. When-ever asked I contribute images to The Wildlife Trusts and Seasearch free of charge for use in their campaigning for protection for the UK’s coastal waters. 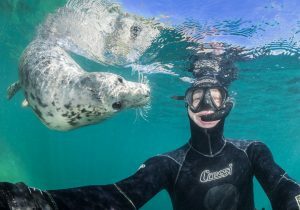 In both 2011 and 2013 I was extremely fortunate in winning the British Underwater Photography Championship / BSoUP Splash-In. In 2014 I co-authored an electronic book about Nudibranchs of South West England with Terry Griffiths and Bernard Picton. The book is available in both iBook and ePub formats. I continue to shoot as much as I can all year round, but as of late 2014 I no longer post on ‘social’ media sites. Making my photography more personal again (like it was in the days before everyone knew everything about everyone-else) has been a very [photographically] rewarding experience. In 2016 I was amazed, but very pleased, to be named as the British Underwater Photographer of the Year. A high accolade indeed and very gratifying to see a UK image holding its own against images takes from all over the globe. I regularly contribute to Underwater Photography Magazine with book/kit reviews, technique discussions and ‘parting shot’ features. I am part of the triumvirate who own/run the Underwater Photographer of the Year competition. In just a few short years this has grown to be the most respected and largest underwater photography competition in the world. For my part I design and develop the website, online entry portal, and a back-end competition management system that deals with many thousands (and gigabytes) of images. In just 16 days after the 2018 results were announced the UPY website had over 250,000 page views.